I woke up Saturday morning not feeling well. I had been shaky all night, but didn't know why. I woke my mom up and asked her to take me to the ER after vomiting. Instead of driving 45 minutes to Mass General, I decided to have her take me to a closer hospital that I usually go to for things like kidney stones, that are easy to deal with and not life threatening. I also had my appendix out here 3 months ago. I had a fever of 102+, and they immediately started giving me fluids, steroids, and zofran for nausea. My blood pressure has been below 90/50 the entire time I have been here except after eating for the first time last night. Recently, after many mornings of being out of breath and out of energy after walking from my assigned spot 0.4 miles away, I asked for a handicap permit so I could park closer to work. I have had chest pain, stiff joints (especially in the morning), and shortness of breath, all due to Lupus. I have not told a lot of people that I work with, simply because I know that judgement that will come from it. No, I will not use my permit to park closer to the grocery store when I am feeling fine. Yes, I may use it on days that I am having a hard time getting around, or when I am especially short of breath. When a friend asked how it helped me, I tried explaining that it gives me a more positive start to my day. I don't start the day feeling sick, I start it feeling a little better, and with more energy to give to my job. The best way to explain this? Spoons, obviously. If you are not familiar with The Spoon Theory by Christine Miserandino, you can read about it here. The past few weeks have been a little crazy. First, I turned yellow, then less yellow, then more yellow (repeat x5), we figured out that was caused by hemolysis (a breakdown of your blood cells), tests results come back relatively normal. A few weeks later, I notice weird swollen glands. Fast forward 2 weeks and I go back to the doctor for chest pain. All tests, X-rays, EKGs come back normal. Follow up with hematology reveals that I may have Lupus (cue tears). Now, I have a big, red, angry rash on one cheek and a swollen, painful eye and face, maybe periorbital cellulitis? So I've been just a little busy trying not to end up in the hospital. After many tears, one sick day from work, and a grand total of 3 visits to my PCP's office just this week, I'm ready for a timeout. A vacation not just from work, but from my other full-time job of trying (and failing) to stay healthy would do the trick. 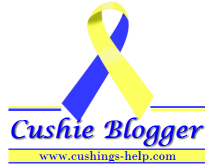 As you may have noticed, I have chosen not to do 30 blog posts in April for Cushing's Awareness this year. I had a lot going on, and found it difficult to not repeat so many posts last year. I am asked why I blog about Cushing's a lot. Why would someone post so many personal details (especially health related details) out for anyone to see? I blog about Cushing's, and the aftermath because it has totally taken over the last 10 years of my life. I blog about Cushing's because no one should have to wait 6, or 10, or 20 years for an answer. I blog about Cushing's because when I knew what was wrong, no one else had ever heard of it. I blog about Cushing's because it's not a small, easy thing to conquer. I blog about Cushing's because there are people that I see every day that likely should be tested for Cushing's. I am definitely not a viewer of televised sports. Sure, if I am offered a ticket, I love going to a Red Sox game, but I will not voluntarily stand in the cold rain or snow to see the Patriots play in person. I will watch the Super Bowl if the Pats are playing, or the world series if the Red Sox are, but other than that, I would rather watch Friends re-runs. There is one exception to this rule - THE OLYMPICS. I love everything in the Olympics, summer or winter, this is my every 2 year sporting event. I watch the prime time coverage whenever I'm home, sometimes I even DVR it if my favorite events are on, I'm a huge fan. Remember that time I had Cushing's Disease? My Cushing's Dreams are finally coming true - in 2 days (!!!) I get to speak at HARVARD Medical School! My endocrinologist teaches a session on pituitary disorders each year, and this year asked me to come along. I have a brief presentation prepared, mostly pictures of me over the years, gaining more and more weight and becoming more symptomatic. I will answer questions at the end also! I have done this once before, as you may recall, but other people did the speaking for me. My friend in PA school did her final group project on my Cushing's journey, so it's nice to have a little experience under my belt. Happy New Year everyone! I hope you all got to celebrate with friends and family. I obviously spent it here in my friend's vacation house looking up at a ski resort. (Although, we didn't ski. It was too cold). 2013 was another roller coaster year. It started in the hospital with adrenal insufficiency, and ended with hormone craziness that left me on the verge of tears for 2 weeks. I managed to fight through an adrenal crisis, kidney stones galore, hemiplegic migraines, and never ending strep throat. I got some attention from boys (nothing serious though), spent more time with great friends, and managed to sneak in 2 vacations, one to Martha's Vineyard and one to New Hampshire. The biggest, greatest part of my year? Huck, of course. He's been my constant companion, my guard dog, my walking buddy, and my couch cuddle buddy. Hands down, best thing that will probably ever happen to me aside from having/adopting a baby someday.